As INGV reports, an unusually strong eruption occurred at Stromboli on 15 December 2006. Bombs landed on both Pizzo and the Sciara del Fuoco, reminding that it is not completely safe to stay on Pizzo. On a visit to Stromboli on 5 Nov by the VolcanoDiscovery team, Stromboli volcano was observed to be in relatively low activity (the lowest observed during the past 15 months), although there are still 7 active vents. The hornito in the NW crater continues to emit powerful, noisy jets of gas and few incandescent fragments. The central vents have typical strombolian bursts every 10-20 minutes, usually less than 150 m high, except for the vent in the NE corner of the central crater which was observed to produce tall candles, up to 3-400m high, about 1 time per hour. The NE crater vent (towards Stromboli village) has moderate eruptions about every 20-30 minutes, to about 100-150 m height, showering the E flank of the crater with incandescent bombs and emitting dark ash plumes of small size. 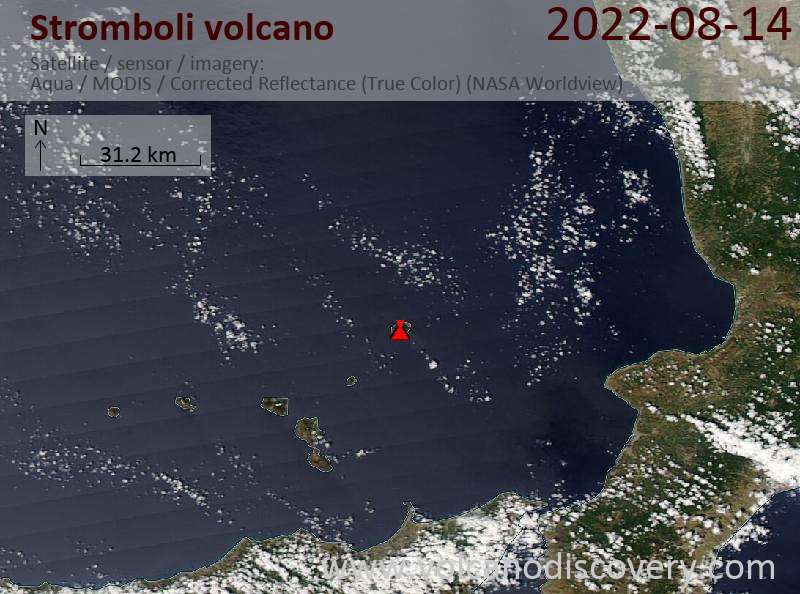 An unusually strong explosion took place on Stromboli on 16 Oct. at 19h11 local time. One of the vents of the central crater emitted a lava fountain that lasted 14 seconds, throwing large incandescent blocks all over the crater terrace and the upper slopes of the Sciara del Fuoco. The lava emission was followed by a strong jet of gas that lasted 3 minutes. During our repeated visits the week before, we observed the strong activity from 5-10 active vents that has been characterizing Stromboli's activity for over a year now. There are about 10 active vents, 5-7 of which are constantly glowing. Constant spattering is frequently observed from at least one or sometimes several vents in the central area. The vent in the former NW crater has now built up a steep cinder cone that produces very tall lava fountains, sometimes up to 400m height. The vent in the NE corner of the central area (the "NE-cone") that had had the shape of a steep, pronounced chimmney-like cone has now collapsed a few days ago; it is now a broad flat ring-shaped crater. The NE vents are having a more usual, lesser activity with small to moderate sized strombolian explosions every 20-40 minutes. Gas jets: The characteristic, fountain like eruptions that interest the vents in the central and western area of the crater are usually starting with a jet of incandescent, greenish to bluish gas (methane? ), and then evolving into true lava fountains lasting 10-20 seconds. Smoke-rings: Just before its collapse, probably on 28 or 29 June, it went through a phase early on 28 June where it was producing many steam rings at intervals of few seconds. Also some of the other vents are sometimes observed producing smoke rings. Detonating noises: Some of the explosions, particularly the ones from the NW crater vent are accompanied by extremely loud detonating noise, that can often be heard clearly all over the village of Stromboli. The crater terrace on 4 July with the collapsed NE cone crater erupting violently. 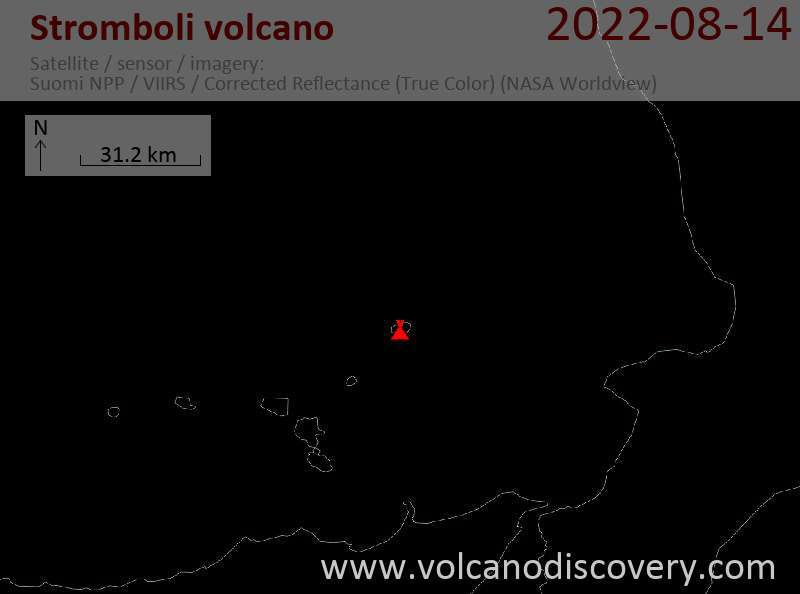 During the past weeks and months, Stromboli has continued to show extraordinarily high activity as several groups of VolcanoDiscovery have observed. During a visit on 24 June, 9 active vents were counted: two active vents in the NW crater (towards Ginostra), one of which exploded with tremendous noise every 20-30 minutes, throwing powerful jets of burning gas followed by large amounts of spatter to heights of up to 3-400 m, showering the OUTER rims of the crater terrace. A neighboring vent, a few meters away from it, is normally not visible, but when it erupted, it had the appearance of the ground opening and emitting glowing ash that slowy rose, blackened and created small ash plumes. In the central crater, 4 visible glowing vents and one hidden behind the wall were active, the most prominent being the tall cone in the NE corner of the complex. The NE cone was spattering constantly, throwing spatter to considerable 50-100 m height. This activity was interupted every 5-10 minutes by strong, hissing fountains lasting up to 20 seconds, and thowing incandescent material to up to about 250 height. At times, the force of the fountain activated a second vent next to it, on the SE side of the cone, apparently serving as an additional valve whenever the output rate during the fountains from the cone itself becomes too large. Two other vents in the central crater complex were large, constantly glowing holes, but showed only occasional weak spattering and erupted only rarely strombolian bursts of spatter to 100-150 m height. A fith vent is not visible from Pizzo, but on a visit on 15 June, it was observed to erupt spatter occasionally to about 100 m height (about once per hour).On 25 of June, it was not erupting. Last, there were two active vents in the NE crater (towards the village of Stromboli), one of which erupts spectacularly about every 20-30 minutes, throwing lots of incandescent bombs towards the E, showering the outer crater slope with bombs. These eruptions also produced dense ash clouds. A first set of photos taken by Marco Fulle during our tour from 20-28 May are online at Stromboli Online here. According to reports from local correspondants, activity at Stromboli's craters is very strong these days, with frequent and tall explosions from several of the active vents. Marco and a small group of VolcanoDiscovery are on their way to Stromboli to get a picture.